It was organized by the Queens Jewish Community Council, and should represent a nice swath of the Jewish community. Nephtuli tagged me with this one, and it's actually something I've thought about in the past, so here goes... I really liked Nephtuli's own list, too. All five were on the money, and I'd have probably done 1, 3, or 4 myself if he hadn't. List 5 bloggers and in what subjects (or fields) you think they're especially knowledgeable. I'm tagging the bloggers above except David, and instead tag David Linn and/or Mark Frenkel who host his [excellent] posts at BeyondBT. Eh, screw that - whoever feels like doing it, should. Let's all heap praise upon one another (except on me - my expertise is football). It would be interesting to see what talents people think one another have, wouldn't it? No no, not me. We had a great Shabbos in Far Rockaway, then I drove with a few friends yesterday morning for a bris (circumcision) in Baltimore. The only rough part was the traffic on the way back to New York. Ugh. I do alot of scary things...being a Hatzala and MDA EMT volunteer, who's on call around the clock -- I unfortunately see all sorts of pretty gory scenes. Mass casualty attacks, terror attacks, horrendous car accidents, or just something ordinary -- like a heart attack victim who needs CPR -- all of these situations have a "scariness" factor to them. Running after terrorists is another situation with a high scariness factor -- getting a message in the middle of the night that the fence has been cut, and there may be a terrorist running around means I grab my M-16 rifle and run out the door. Maybe it's easier because there isn't any time to contemplate the danger involved -- you just act based on your training and try to do what needs to be done. It was one of those crazy afternoons. DH, child #1 and I were just at my office ready to collect child #2 from daycare across the street. We were heading out of town to go 200 miles to the south to be with family for Shabbat and the weekend. And then DH – the Jewish professional – got the call. He swore and paled. I heard the words "shooting" and "Federation." And I just assumed it was in some other city. It was in my town. Of course we headed back to his office, our phones immediately ringing off the hook. The press, both local and national, other community leaders, rabbis and more. He fought to keep up and keep abreast of the developing tragedy. The person was still at large and the scene was unfolding. Life-of-Rubin has some war humor. Meryl comments on the Seattle shootings. Jpost is talking about it. They all leave out the key point. Katyushas will not stop falling on Israeli soil for those 48 hours. WorldNetDaily has a very good article about the recent find of a Psalms from over 1,000 years ago to Psalm 83, which pleads for God to let Israel beat its enemies who wish its destruction. It's a worthwhile read, so check it out. It also points to a (Christian made, with music) video which is very well done, which uses images and the words for a nice little video. "For this to have been an act of God, God would have to have been all-knowing, foreseen this very conflict roughly 1,000 years before it occurred, foreseen the bog market, foreseen the use of power tools, foreseen the individual working the equipment and ensured this particular one was working that part of that bog that day, have created the book of its various parts (leather, the paper within) in the first place, have placed it in that place for 1,000 years of earthquakes and various other acts of God, foreseen the person who purchased the land would happen to be of the save artifacts mindset (not common among money-hungry landowners) and foreseen the need to it open to that page on that day. I don't know, seems all haphazard to me." ARGH!! You... idiot!!! This is GOD we're talking about!! He "forsees" EVERYTHING! That's the *&%*&^ point! Sorry. I couldn't help but wonder at the brains behind that one... especially the "God would have had to been all-knowing." Umm, hello?! I'm keeping it up Ezzie, you hear me. Ezzie is such a bully. Emailing me that he linked this somewhere apparently, and then playing on my conscience that I don't read his posts. FEH! This post stays up. You bully. We're off to Far Rockaway for Shabbos, so enjoy this video of Elianna in our stead. Olah Chadasha (of FrenchHill) has a really great post on her new obsession with chasing Katyusha rockets, similar to her old one of chasing tornadoes. It's really a great read. She even has some video. David (Treppenwitz), meanwhile, is part of a group of people who are delivering underwear et al to soldiers on the front, many of whom only have a few days' worth of... err... necessities. You can also help support soldiers in general there. Chayyei Sarah found a really funny site - I was cracking up at a bunch of these. Credit to Elder of Ziyon for raising $2,000 for Israel... half of it his. He's extended it, so if you want to give, he'll match some more. He and Israel on Level Ground both report on the new Intel chip - from Israel. EDIT: Forgot this good one by Orthonomics about wedding clothes. Another stupid Jewish "custom"... sigh. "No!!!" he yelled, clutching his knee. Stretched out on a flatbed cart, LeCharles Bentley covered his face with a towel to hide his disappointment and tears. This wasn't the homecoming he had planned. His first season with the Cleveland Browns ended before it began. Bentley, a two-time Pro Bowl center and one of the team's prized free-agent signings this winter, sustained a season-ending injury to his left knee on the first 11-on-11 drill of training camp Thursday -- a crushing blow for a club seemingly cursed by major injuries the past few seasons. "He was the face of our free-agent class," general manager Phil Savage said. "We feel terrible for LeCharles, but life goes on." Savage said Bentley tore his patellar tendon and will undergo surgery as early as Friday. Savage declined to say if Bentley's tear was partial or complete and would not speculate on a timeframe for recovery. Blocking for Reuben Droughns on an off-tackle running play to the right, Bentley, who played four years at New Orleans, was briefly engaged in a block up front with nose tackle Ted Washington when his left knee buckled. Bentley screamed, "No!" and grabbed his knee as Cleveland coach Romeo Crennel and his staff blew their whistles to halt play. While on his knees, the 26-year-old Bentley punched the ground in disgust as the Browns moved their scrimmage up the field so the club's medical staff could attend to him. AbbaGav has a great post about a subject I've been wondering about. It's a subject that has barely been touched upon, even in the blogosphere (though it got a bit of a mention at least). But to hide from that fact, to pretend that our lives are only worth defending if the action photographs well, is slow suicide. So we face the fact that accidents happen, and we work to correct them. We face that our enemies violate the most basic rules of war, forcing their own civilians to stand between them and incoming bullets. And we face the photos, forcing ourselves to answer the question of whether we are right, rather than simply letting others answer in the negative for us. We face the fact that AP and AFP and Reuters don't care why or how so many civilians are hurt while gunmen operate among them, since Hizballah's script is so much more photogenic than an IDF press conference explaining ballistics and targeting angles. So I took my stroll. You probably won't be surprised to learn that out of the approximately 1000 images I've clicked through over the last week or so, there were a lot of pictures of refugees -- refugees sleeping in schools, refugees fleeing in cars, refugees being evacuated by kind and gentle non-Israel soldiers -- but not one of them Israeli. There is so much good material out there (including SoccerDad's daily version of Haveil Havalim), and if you read a number of blogs you've probably already seen a few of the following. However, my guess is you haven't seen them all, and they're simply so worthwhile. Some will make you smile, some cry, some will get you riled up or calmed down. I'm not sure if this will be a long list or not, but since there will be a couple short videos, I'm putting it all after the jump. Many of the blogs are of the 25 or so new ones I'm checking out lately, and please feel free to mention more blogs in the comments. Tall Latte writes about the rally her husband organized, but the best part of this post is not even the excellent points she makes about rallies; it's the surprise ending to Flags & Straps. Beautiful and inspiring. (via Meryl and Judith) Vital Perspective has a map of Beirut. So what's notable about this map? Well, look for the gray areas. You found them? They're hard to see. 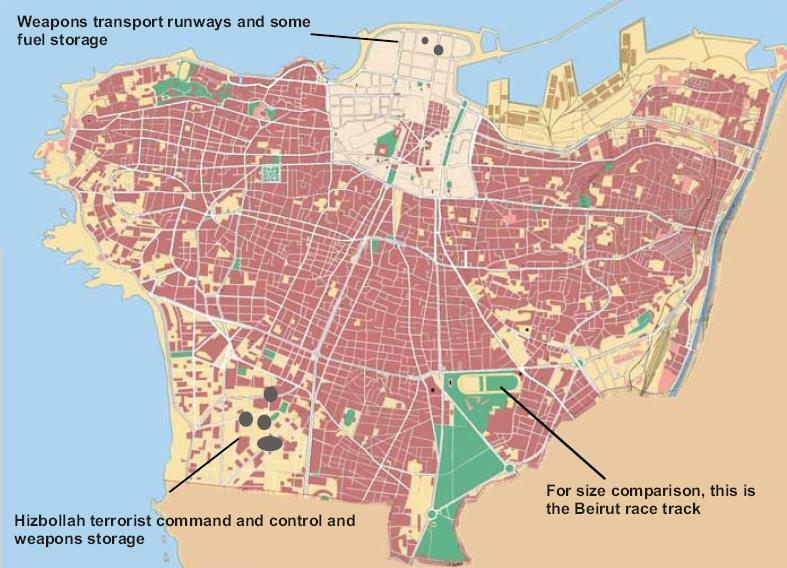 Anyways, those are the areas of Beirut that have been bombed by Israel. [click on the map for a larger version] Worth remembering next time you see pictures of rubble and how Beirut is being destroyed. A lot of people have this, but I saw the full text only on YeshivaWorld. CNN's Andersoon Cooper's blow-by-blow of a Hizbollah "tour" is incredible to read. I did see it first on Hayom, who contrasts it beautifully with CNN's first report on this. Bagel Blogger has four of them. Four! I'm posting the inspiring one here, but check out the other three as well: Yalla Na Nasrallah, a funny song from the IDF to Nasrallah [with great images]; another one of IDF soldiers having some fun spoofing some of the best GoogleVideo stuff there is; and the great Israeli peace initiative, which shows an IDF soldier having some fun with Arab kids. Aussie Dave, in the midst of his excellent coverage, has the pictures and bios of 8 of the IDF soldiers who were killed in battle yesterday. Jameel has left the Muqata updating to others, and is now volunteering his medic services up North. WestBankMama says Beware the Tel-Aviv Rose. Sharp as always. Ze'ev says it is time for Israel to let itself win. So does JoeSettler. DryBones has a comic that is right on the money for what is happening now... only he wrote it in 1982. IfYouWillIt says that life goes on as normal, basically, while Jack notes that we have to definitely try to do so. RafiG has the War Picture of the Day... unless you count all the ones at Balaboosteh. 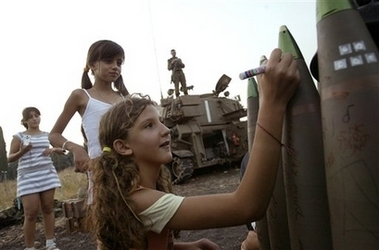 Or these incredible images of Tefillah on the Battlefield (hat tip: Sara). LakeVent, meanwhile, may have the funniest picture of the day up for a caption contest. There are countless posts on the UN, the stupidity and bias of Kofi Annan, etc. This post on IsraelRules pretty much sums up the main points of all the others, so check it out. Their other post questioning whether this could backfire into the UN in worse ways than the Oil-for-Food scandal is a good one, too. Daled Amos notes that Israel has had its UNIFIL of the UN, also covering the key parts of the story. Israel at Level Ground has a great cartoon and piece on it as well. Elder of Ziyon notes that the world's #3 news reporting service has a timeline of events in Lebanon. He also notes that it only has half the story. Guess which half. Meanwhile, Canonist notes that Air America is calling Israel's actions "genocide". Another reminder to those who generally lean left to be wary of those who claim to be on their side. Bein Adam L'Chaveiro hates when people tell him he's "so frum", while Wolf wonders why his daughter can't play with someone who isn't Jewish. BeyondBT's Shabbaton is coming up - here are the details. David reminisces about the troubled first year of marriage he almost had... that's what happens during the 9 days. And apparently it's not just in Year One - ask PsychoToddler, who also think his family is the biggest J-Blog family out there. Shira has other 9 days troubles. FrumWithQuestions has some 9 days questions... anybody want to give it a try? R' Ovadia Yosef cancelled vacation for yeshiva students (via YW), which makes perfect sense: If they are saving the country with their learning, how can they abandon it in a time of war? Excellent stand on principles. A lot of people had this, but I think I saw it on RafiG first. An ancient Psalms was found in Ireland... open to Psalms 83, one of the ones normally recited at times like these. To understand the power of Tehillim, check out these two posts by Chaim. I've been outed by Chana. :) Pearl, meanwhile, has great pearls of wisdom... and what's a roundup without a good RenReb rant?! LabRab needs people to sponsor him as he rides for One Family, which supports victims of terror attacks. A great cause, so help him out. Thank you to Sarah for yet another great icon. Only parts of this post are applicable to each person, but please read the whole thing anyway to see the ones applicable to you. Anyways, you've probably noticed the icons to the left. Those icons are links to what I think are important blogs and posts: A Balaboosteh is putting up images from the war, some of which you might see, many of which you would not see, when you read or see the news. J-Blogosphere, meanwhile, has links to many of the bloggers who have and still are "live-blogging" the war, giving an insider's perspective to what's going on. Equally important are the comprehensive list of charities, so carefully compiled by Chaim. Also important are the rallies that have occurred and will be occurring around the world. The rally icon to the left links to a very comprehensive list, including recaps we've found of those which have already happened. For example, rallies have just started in Toronto, Ontario and Wilmington, Delaware, and there are more later tonight in Oklahoma City and Waikiki, Hawaii. (You read that correctly.) Closer to home, there's one just a block away from us in Kew Gardens Hills next Monday at 6:30, which I haven't even added to the list yet. At the Back of the Hill asked me to announce one as well, and I think it has added importance: This rally will likely get a larger piece of media attention than most rallies, which are simply ignored. It's a counter-protest rally in San Francisco, against a protest that accuses Senator Feinstein of "supporting Israel's war crimes" against Hizbollah. The previous rallies and protests on both sides in San Francisco have garnered much attention, and this one undoubtedly will as well. I was going somewhere with this post, but I got completely distracted and I have no clue where. (This was supposed to go up hours ago.) So... please look at the charities and see if you can help - every dollar helps - and check to see what rallies are in your area. We haven't even included the countless tehillim gatherings around the country, simply because there are (thank God) just too many to include. Unfortunately, aside from it falling out on the most somber Rosh Chodesh of them all [today is the first day of the Jewish month of Av, and the beginning of a 9-day more serious form of mourning], I also am about to head to the doctor to have my throat checked. It basically feels completely tight and/or swollen at the same time, and it kills me to swallow; it feels like the right side of my throat is clogged all the way to the ear, while the left is only a little bit tight. I haven't had a cold or anything like that recently, and I don't know what strep feels like because I've never had it (thank God). Hopefully it's nothing and will go away; an Allegra did nothing, so it's not that. The good news is that aside from that, I feel fine. No headache, nausea, anything like that. I rarely get sick, but I used to get frequent migraines; since I went to Israel, however, those have been very infrequent. So, hopefully this will pass quickly, and I can enjoy my birthday. UPDATE: Well, the doc says no strep, just viral. In a way, that's better, but there's no antibiotics, which means I just have to wait it out. It's a bit better than this morning - I can eat, at least. Thanks to all! Glossary (loosely translated): Shidduchim - Matchmaking; Bitachon - Trust [in God]; Middos - Character traits. When financial issues are addressed, the chorus is "bitachon, bitachon, bitachon." I wish that the same chorus could be heard regarding shidduchim: have some bitachon. There is a match out there for each person, even if the person faced unusual challenges, even if the person didn't go to the "right" schools, even if the families didn't do the "right" things. The right shidduch might not come with the "proper" yichus and the proper family. The right shidduch might not come in the right shell. The right shidduch might not come from the right money. But, ultimately, the right shidduch is the right shidduch (even if that spouse shows up late). So, seek the help you need and (when it comes to criminal acts like molestation) remember that others need protected too, and that your good name is not the only name needing protection. First of all, that comment sums up the last post perfectly. But more importantly for this post, as I was thinking about this comment, a troubling thought came to mind: Why is it that this is? Why are people so intent on doing every possible thing within their power - to the point of ridiculousness - when it comes to shidduchim, but when it comes to earning a living, people say "bitachon" again and again? Are some people just using bitachon as a convenient cop-out answer when they simply don't have a plan, or don't want to work? Normally, I would hesitate to ask such a question, but the shidduchim aspect shines a light right on the situation. If people truly felt that a certain level of bitachon is necessary in life, they wouldn't allow all the inanities affect how they approach shidduchim. Being a good person with proper middos who works to the best of their abilities would be more than enough, especially if one has even a small amount of bitachon. It seems as if the bitachon people have is either lacking or misplaced. Two Orthodox Jewish men have come forward to say they were molested by a Brooklyn counselor who was indicted in the 1980s for sexually abusing kids but skipped to Israel before he could be prosecuted. Retired Detective Salvator Catalfumo said the investigation "began with an anonymous caller who said there was a rabbi living on the street molesting children. "It was very difficult pursing this case," he recalled. "The Hasidic community wanted no part of this. We were told that if a Hasidic kid was molested, no parent would allow their daughter to [marry him]." Let's let a child molester go free because it "might ruin a shidduch"?! Sadly, I know all too well that this happens consistently. A child molester I know of is free today because nobody was willing to testify against him, for the same reasons. He then went and molested even more children, none of whom had parents who had them testify. All too often, in these cases, these molested children grow up and molest others. In some cases, those who are molested are never able to seek proper treatment, because their family is too concerned with their future shidduch, and they end up with ruined marriages [sometimes molesting others even while they are married]. The selfishness of those who won't let their children testify for the sole reason of "ruining shidduchim" is disgusting. They are in a very difficult situation, and I could understand not wanting to testify for other reasons. But because of your child's shidduch you'll allow countless people's lives to be ruined!? Disgusting. Famed author of several controversial books on Biblical Zoological, Torah and Science. Does Intelligent Design Belong in the Classroom? Is Evolution Heresy? Seeking Scientific Truth in the Torah - or Not: Do We Believe the Torah or What Science Says About the Creation Account? While our soldiers in Israel do not get any breaks in their fight against terror, we do, and I need one. So here are some posts from today which I've seen that you may enjoy, learn from, or just find fascinating. Irina is up to Part III of a great story - it doesn't take long to catch up, just don't read it right before you go to sleep. Kasamba is taking off for the summer, but in hilarious fashion. Robert points to a very telling video of Nasrallah. PsychoToddler gets all whimsical in a book review - perhaps he has a future as a book critic... maybe even his daughter Fudge's books, who just wrote one of the funniest posts I've read in a while. That's all for tonight. I'm wiped. I looked at my blogroll recently and... it's old. I read blogs through Sage, Firefox's RSS reader (I recommend it!). When I've added blogs recently, I just add it to that. My blogroll, meanwhile, has stayed the same. So... check my blogrolls (Blogroll, Family/Friends, Israeli). If you're not on it, leave a comment with your URL, and I'll be sure to check it out. If you're already on my RSS reader, I'll hopefully remember to actually put you on this time. If you're *not* on my reader, I'm sure it's an oversight, and I'll add you to the reader, and maybe soon I'll remember to add you to my blogroll if I'm enjoying. Feel free to add people besides yourself as well! At JBlogosphere, where I've been spending most of my time when I have had a chance to blog lately, Chaim has put up an ever-expanding list of charities that could really use support as the war in Israel continues. If you see one that's not there, please contact him and he will add it when he can. Included are two that I was contacted about, both of which are great ideas (as are all the rest) - the Orthodox Union's emergency fund and Friends of the IDF. Krum talks about the first, the couple from the French Hill the latter. Elder of Ziyon has agreed to match up to $1,000 to a few different charities [combined] as well. Yiasher Kochacha, EoZ. Daled Amos also has a nice list. There are pro-Israel rallies about to start in a few places around the country: Check out the listings at JBlogosphere. I'm not sure why it didn't work the first couple of times, but it may have to do with it being a "private" video. So... for a short time only... you can click on the link and see Elianna cracking up (and tell us how cute she is here because Serach actually reads the comments of the Elianna posts. :) Maybe this will get Serach to blog! ;) ). Anyways... enjoy!! Isn't she the cutest? :) Have a great Shabbos, everybody. Every. Single. One. Balaboosteh has more pictures from Yonatan Hadassi's funeral, along with pictures of everything else that's going on. Click on the Images of War icon to the left for more. Jack has a reminder of what type of people we're fighting against, but I would not recommend it even for the strong-stomached. I couldn't get past about 2 minutes. It may, however, be the most important video that world leaders, journalists, and others should see - but will not. You may have noticed the latest sidebar additions - well, now there's another one. The JBlogosphere has a somewhat comprehensive listing of all the rallies around the world - and could use your help filling out the rest. Click on the icon to find the rally nearest you. If you have attended a rally and have written about it and/or have pictures, please leave a link in the comments section there - thanks! Yesterday afternoon, someone asked if we could give two cute 12-year old girls a ride to 7-11, pizza, and the movie theatre (where they would get picked up by an adult). The two girls were an interesting pair: Yasmine (Jasmine), of Queens, is the daughter of a Syrian mother and Israeli father (both Jewish); Sher, meanwhile, is visiting for a few weeks from Haifa, staying at her aunt. Yasmine is religious, while Sher is not, yet the two tweens have become fast friends. While we were driving, I interrupted their smiling at and playing with Elianna, whom they adored immediately, to ask a question. I asked Sher if her family is concerned about what's going on in Haifa, considering how much it's been hit. She calmly responded, "Eh, not really... but my aunts/uncles and cousins in Israel were concerned, so they gave my family money to go down (south) to Eilat. They're staying in a hotel there." We then asked her if she herself was concerned. "No, not at all." After a short pause, she added what many young Israelis add on short trips to America: "I want to stay here!" We laughed, explained that New York is a great place to visit, terrible to live, and her good friend Yasmine seemed to agree. Sher doesn't want to stay, but it is simply because she's having a great time, as evidenced by their little outing. In just the 15 minutes they were with us, we could see them having a fun time, sipping on their slurpees, buying tickets for their movie, and getting some pizza. When it comes down to it, however, I'm willing to bet that Sher walks straight onto the plane without hesitation. Sher may be too young to appreciate all that's happening, but she's responding much as I remember Israelis responding when I was in Israel amidst all the suicide bombings - aware of all that's happening, but going on with their lives. 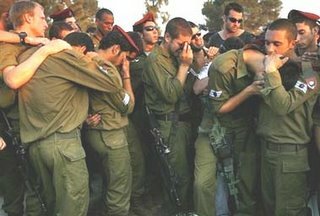 This is how we do it: An IDF tank crew begins their day's actions by reciting "Tefilas HaDerech", the "Prayer for the Way". If anyone can find a good translation in English that I can post, I would really appreciate it. Thanks to the Muqata and Olah Yashan; on another note, see the beauty of Israel from the backyard of OY and his wife Olah Chadasha. Stunning. The two of them, Dave (who I got the missile piece from yesterday, forgot to mention - sorry), and all the others are still live-blogging everything that's happening. "May it be Your will, Adonai, My God and God of my ancestors, to lead me, to direct my steps, and to support me in peace. Lead me in life, tranquil and serene, until I arrive at where I am going. Deliver me from every enemy, ambush and hurt that I might encounter on the way and from all afflictions that visit and trouble the world. Bless the work of my hands. Let me receive divine grace and those loving acts of kindness and mercy in Your eyes and in the eyes of all those I encounter. Listen to the voice of my appeal, for you are a God who responds to prayerful supplication. Praised are you, Adonai, who responds to prayer." Because we could all use a little levity right now. Israel Drops 23 Tons of Explosives on Hizbollah Leaders? Israel had intelligence they deemed good enough to bomb a building under which was a bunker that their intelligence said housed Hizbollah chief Nasrallah and many other Hizbollah leaders. There were drones around the area before, during, and after the attack. A large number of IAF planes were part of the attack, dropping 23 tons of explosives on the building. Hizbollah just now commented - many hours later - that it was a mosque under construction that was hit and nobody was hurt, while the IDF is trying to determine if the attack was successful. The attack was in Bourj al-Barajneh, which is a Hizbollah stronghold that Lebanese officials cannot access. Israel also stated that its intelligence had deeply infiltrated Hizbollah. face of the dead in their minds. too aware of our own suffering, etc. make sense? I really cannot understand the disgusting moral blindness of people. 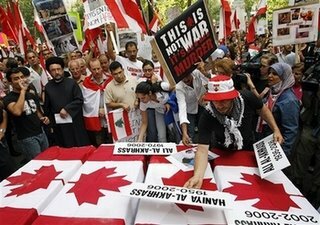 Now, I can somehow expect these kinds of demonstrations in the Arab countries, but I don't understand how Americans can do this? Do they truly do not see that ISRAEL was the one attacked first by Hezbollah? Let me repeat that. Israel was the one attacked first. Do they not understand that during war civilians die? Do they not understand that Lebanon has done NOTHING to rid its country of Hezbollah? What do these idiots suggest Israel do? Knock door to door and ask politly if there are any terrorists are present? How come they never answer these questions? Yes sir, you are right. The people of Palestine do deserve to live in peace. If only your peace loving brothers in the Lebanon would just stop attacking us. Logic, does not seem to be these peoples strength. I think these two girls should be protesting the guy with the "Islam will dominate" sign. 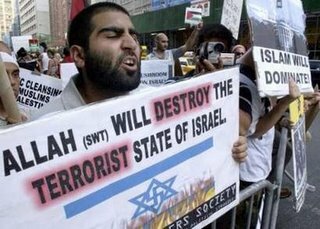 If Islam does indeed win, I don't believe they will have the freedom wear those un-tznuis clothes. Uh huh. And what Hezbollah is doing to Israeli's is NOT murder? Fine. 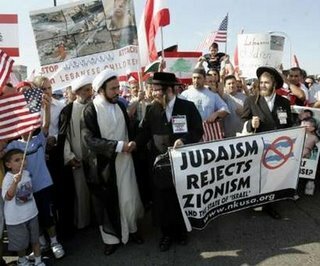 Lets just say Judaism is against Zionism. Does this mean you have to side with the people that want us dead? That are murdering us? I just don't get it anymore. 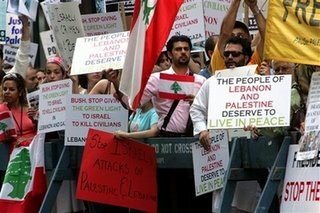 Some of these photos are from a demonstration in front of the Israel Consulate in New York. Anyone see anything? After a quick dinner at Dougie's with a number of other former and current Lander students*, we drove over to the Young Israel of Kew Gardens Hills for the book launch. I'd estimate that there were about 150 people there, most of them not bloggers, if you can believe it. There were a few in attendance however: Obviously, R' Gil Student, part of Yashar Press who published the book, of Hirhurim; Steven I. Weiss of Canonist; Nachum Lamm of Lammpost; Mark Frankel of BeyondBT; David Kelsey of Jewschool; and BrooklynWolf of WolfishMusings. Also there was Steve Brizel, and David Linn says he cut out early. As he spoke, it got better; I particularly liked his points about Jewish education when discussing youths - he noted that when students are told one thing when they are young, then grow up and find out that it was all untrue, they will simply say "forget it" and walk away completely. Next up was R' Gil Student, who essentially gave more of a halachic discussion than a speech, but it was quite good. His prepared notes will be posted lateron Hirhurim. He went through three reasons why he felt the book could and should be published despite the 'banning' by some rabbonim, notably R' Elyashiv. His first reason took a while, but ended up coming to the conclusion that while they were within their rights to ban it based on the opinion who does hold that "what one Rabbi said was allowed, another cannot say is not allowed" or by claiming that R' Elyashiv et al are much older and more knowledgeable, neverthless we generally hold that what others already said was muttar (permitted) cannot be made assur (restricted) by another rav. As there were a number of rabbonim who wrote (very nice) haskamos (attributions) originally, one can rely on those rabbonim. His second reason spoke of the distinct subsections within the Orthodox community, and how one is permitted to follow the rav of his own community. He compared it to a Satmer Chassid asking a shailah (halachic question) about Satmer from a Rabbi who is from the more Yeshiva crowd - he wouldn't; or a Religious Zionist hesder student asking a question about the army (I think he used the example of pulling someone out of their home during disengagement) from R' Elyashiv - he wouldn't, either. Each would seek out the leaders of their communities (Satmer Rav, R' Lichtenstein/R' Aviner). Personally, I thought that this pointed to a larger issue: Instead of people respecting this idea, the idea of a ban by one segment was meant to apply to all the others. This, IMHO, is overstepping the bounds - it should have been presented as a ban for certain communities that are completely under the guidance of those rabbonim, and not meant towards everybody. His third reason discussed the idea of asking one's local rav, and that while these lines have blurred in today's day and age, local rabbonim should be determining what is right for their communities when it comes to matters such as this, and not rabbonim from other areas. He used R' Chaim Ozer's response to a section of Frankfurt in the early 20th century as a prime example of this. The last speaker was the man of the evening, R' Natan (Nosson) Slifkin. He discussed the... cover of the book, and how the book is not for everyone. 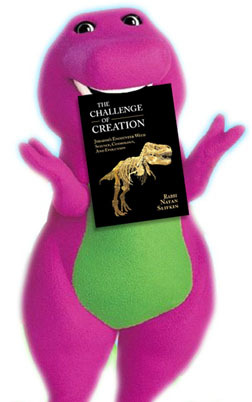 The cover signifies this, and a serious point that those who don't like the book fail to address: How do they explain things such as the fossil record, dinosaurs, and the like? He took out as an example a dinosaur tooth (which led to one of the better lines of the night: "I can't pass this around, because another time someone broke it and I had to glue it back together. Imagine that: It survives 100 million years, and someone managed to drop it and break it."). Afterwards, I didn't have much of a chance to shmooze, talking with Gil for but a moment (he was a bit busy, understandably), and just introducing myself to R' Slifkin and his wife, giving them some regards. I was surprised that he immediately knew who I was ["Oh, of SerandEz, right?"]. I did get a chance to finally meet and talk with Mark Frankel, which was nice, and introduced myself to Steven I. Weiss of Canonist on the way out. He either is or looks a bit younger than I'd imagined. He was having an interesting discussion about Jewish journalism with someone, and I'm interested in reading an article he said would appear in (I believe) The Jewish Press this week. All in all, a very nice event, and what seems like it should be a fascinating book. Thank you R' Gil and R' Slifkin. * They wanted to be mentioned, by strange names, so... shout-out to StrongBad, StrongBurg, Shorely, and PsychoBeard (Hey, they're all from Mevaseret, what do you expect?). We also saw at the launch the Blocks (Avi created MinyanMaps), Avi Grossman, and Roni Gaffni. Nu, so was anyone at the launch of R' Slifkin's new book? How was it? Anyone meet that mysterious blogger, "Gil"? O'Reilly & Hannity in '08! Heh. Apparently, my post wasn't the only one on Richard Cohen's embarrassment of an op-ed today... SoccerDad has the whole list. Wow. I wonder if the WaPo will issue an apology to its readers for publishing such stupidity. EDIT: M'bad. Even SoccerDad's list isn't complete. He has about 30 blogs - there are 90 showing up on Technorati at the moment. Wow. Like most folks, I feel very helpless and want to do something to help our people. It took me a few days to even start saying Tehillim, and my first thought was, "Why not? It can't hurt. Maybe it will help." Boink! Of course it will help! I'm in such an unspiritual fog that I don't realize what's really happening here. God is causing this situation to take place. (Hizbollah knows that and they think He's on their side.) When God causes these traumas to occur, He is pleading with us, "Come back to Me." The path is developing a real relationship with God through sincere prayer and communication. It is so hard because it feels like a one-way conversation, if we don't believe that our prayers are accomplishing anything. But they are. But here's a really important point. During the time of King Achav, the Jewish nation worshipped idols, definitely didn't have a strong relationship with God, but they were victorious in war because they all got along with each other. I think this a good message for the jblogosphere. We sometimes go on rants about fellow Jews and other Jewish lifestyles. Although there may be some positive aspects, maybe somebody will be inspired to change their ways, the end result is more likely to be a negative feeling toward our brothers and sisters. R' Yaakov Weinberg, zt"l, said that it is natural to have a Beit Hamikdash in the world and the fact that it isn't being rebuilt means that it is actively being destroyed. Nothing has changed for over 2000 years - we didn't get along as a nation, the stones of the Temple were destroyed, and we still continue to fight, bicker, and criticize and the Temple is still being destroyed. As Ezzie aptly named it the Three Weeks War, we try to work on our person-to-person relationships during this time period. Especially when we feel like we want to help the situation, we should practice loving kindness to each other, and if not, at least refrain from speaking badly about our brothers and sisters. And remember that our prayers do have power. (via LGF) Richard Cohen has an op-ed in today's Washington Post. The greatest mistake Israel could make at the moment is to forget that Israel itself is a mistake. It is an honest mistake, a well-intentioned mistake, a mistake for which no one is culpable, but the idea of creating a nation of European Jews in an area of Arab Muslims (and some Christians) has produced a century of warfare and terrorism of the sort we are seeing now. Israel fights Hezbollah in the north and Hamas in the south, but its most formidable enemy is history itself. The smart choice is to pull back to defensible -- but hardly impervious -- borders. That includes getting out of most of the West Bank -- and waiting (and hoping) that history will get distracted and move on to something else. This will take some time, and in the meantime terrorism and rocket attacks will continue. Someone explain to me why anyone in their right mind would think that the "smart choice" is to pull back to borders that are not impervious, while terrorism continues, while "waiting and hoping" that history will "move on to something else"?! Is this not one of the most illogical suggestions in an op-ed you've ever read? I honestly do not understand how the Washington Post, one of the most well-respected newspapers in the country, could allow such drivel in its paper. Forget the anti-Semitic rants that appear throughout this country for a moment - those, at least, try to make a logical argument, even if they usually fail or inject utter hatred or dishonesty into the discussion. But this... this is just astounding in its sheer idiocy. Like I said, we are fighting two wars here. One of them we are losing really badly. I need a break from Israel-blogging for a moment... so here's a post on making assumptions. As many of our friends and close readers of this blog know, Serach works as a SEIT in the neighborhood while I will iyH start working as an accountant in the fall. Thank God, we both will have very good jobs, with good pay, and my job has very good benefits as well. Many people think that we've got it made: Cute baby, good jobs, happy lives, lots of friends (especially nearby)... and they're right, we do. I can't complain one bit about our prospects for the future and how everything has shaped up. But people also assume - because we have such great prospects - that everything is fine and dandy right now. That we have money to pay all our bills: Our rent, our health insurance, our electric and gas, etc. And the truth is... right now, we don't. We're not even close. We're sitting on [tens of] thousands of dollars of debt, with no chance of even paying off a small portion. There are no rich parents funding us, there are no people we feel comfortable borrowing from (though we have as it is and may again). And before anyone asks where all our money has gone, think about this: In two years of marriage, we've probably had about $25,000 of income, maybe more, maybe less. Take that and our wedding money, subtract tuitions and living expenses, and you're left with a big negative number. We don't "waste" money (though we are not 'penny-pinchers'), and our biggest expense is probably Shabbos, because we tend to have a large number of people every meal. * Other than that, we're pretty much living on a tight budget and still can't afford it. Don't assume that because someone may be or will be successful - even in the very near future - that they already are. Or that someone has money, just because they're not "poor" or complaining. Then there's the reverse. We've talked with a number of close friends who were getting married about finances. Many are worried about how they're going to make it, considering the amount of school they have left, or the cost of living versus what they are making for now, etc. Our friends are smart, so they generally understand this, but others do not: When a person is explaining to you just how much debt they're in, and what the cost of living is, and how hard it is, their point is not to scare you, and their point is definitely not to complain. Their point is to show you that despite all of that, it can be done, and that there is no reason to stress a marriage or a relationship or a life over it. Do you need to be aware? Yes. Do you need to be smart? Yes. But do you need to constantly fret? No - it is only harmful. When someone does tell you about their finances, don't assume it's because they want to complain or whine (though it could be, and they just need someone to listen, so listen!). Often, they're trying to make a point - a point that can help you. I don't need to complain about my finances or inability to pay my bills. I don't need a place to vent - I have a wife, family, and friends for that. I'm not anonymous, so for me, this isn't a place where I can vent anonymously when I don't want to go to any of those - if I needed that, I'd create another blog. (Maybe I did! :) ) That's not the point of this post. The point of this post is to tell people simply: Stop assuming so much. You never really know. *This is the one expense we're pretty much unwilling to cut out, as we enjoy it, we think it's good for us, and we think it's good for our guests. What's somewhat ironic is hearing my friends who have just gotten married comment, when having a Shabbos with just themselves or perhaps a couple of guests, "You know what's really expensive? Shabbos. Shabbos is expensive." Some have criticized Israel for not responding proportionately to the attacks, but we'd counsel patience. After all, the Israelis aren't done yet. 12:27am: The reason the G8 has been backing Israel is because Lebanese PM Siniora asked them to. "The Israelis can do to Hizbollah what I cannot do; let them finish the war." Bush expressed his frustration with the United Nations and his disgust with the militant Islamic group and its backers in Syria as he talked to British Prime Minister Tony Blair during the closing lunch at the Group of Eight summit. "See the irony is that what they need to do is get Syria to get Hezbollah to stop doing this (expletive) and it's over," Bush told Blair as he chewed on a buttered roll. He told Blair he felt like telling U.N. Secretary-General Kofi Annan, who visited the gathered leaders, to get on the phone with Syrian President Bashar Assad to "make something happen." Sorry for the dearth of posts. It's been a bit of a hectic and slow day here at Casa Goldish, so I'm still catching up on all the news etc. 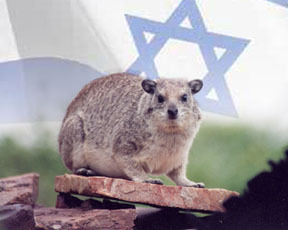 Regular posting will continue in just a little while... meanwhile, enjoy the post by new guest poster Holy Hyrax below (and the ensuing discussion). I think it's an interesting and important one. A while ago, Ezzie invited me over to post something. The only stipulations he gave me was that I can't curse, no liberal crap, and not too much kfira. Ya, my thoughts exactly. This Ezzie guy is some sort of dictator nut. The other reason I did not post was because I did not having anything meaningful to post (outside of a few rants). Well, things have changed now in light of what's going on in Israel. Now, some of you might have heard of a small blog by some shmoe called Godol Hador. Apparently, he has retired,(*holding back tears*) but if anyone has been following his last few posts, some of them have been dedicated to discussions of the Myers-Briggs personality tests (INTP, ISTJ etc). In order to really take these tests, or any other tests such as these, one must really have a good sense of self-awareness. Since then, I have really been doing some soul-searching on a few issues. One, specifically, is what's happening in Israel right now. A few days ago, someone came into my office to talk to my boss. On the way to his office, he passed me, and I overheard him say something like: "WE are going into Lebanon...." All of a sudden, I stopped working. WE? WE? Did I just here him say: "WE?" For some reason, it hit me. How could anyone here say "WE" when discussing anything going on in Israel. We live here now. In American, not Israel. By what right do can we use the word "WE"? As much as we talk about it, we are not the ones being fired upon. We get to sit back and relax at home. Our only connection with Israel at this point is the 10:00PM news. But then something else hit me, and this is where the self-awareness comes in. Why are we really feeling bad for the situation in Israel? What's behind it all? Do we truly care for all the citizens of that country? Do we want Peace? Why? What's behind all the tears and tfillot? I came to the conclusion that the reason is selfish guilt. Now, don't get me wrong, we obviously we care for what's going on over there, but I think the number one reason, before the rest is nothing but guilt playing on our conscience, that we are here, and they are there. Sure we want peace, but why? I think, first and foremost, its because we want to be at ease with ourselves. We want peace there, so we will have a clean conscience living here while our brothers and sisters suffer in the land that we should be in as well. My wife today told me a story of when she was in the tzofim in L.A. during the first Persian Gulf War, they used to hand out Gas Masks to everyone. This was to show some sort of solidarity with Israel. What crap! Do Jews in Israel really care for a bunch of teenagers in LA showing their support by holding on to Gas Masks? If that isn't a way for someone to ease his conscience, then I don't know what is. So why am I writing this? Basically because, I want to admit that I am guilty of being selfish. I am not thinking of my fellow Jews first, but of my own guilty conscience. I can't really help it, thats just how I am, but it's still no excuse. SO, I'm sorry. I'm sorry to any Jew in Israel reading this. I'm sorry that I am not in Israel right now. I'm sorry I'm not in my hometown of Nahariya in the shelter with friends and relatives. I'm sorry that I get to go out, and have fun, while missiles are falling down on peoples homes. I'm sorry I haven't prayed for you yet. MR. RUSSERT: Mr. Speaker, what are we witnessing in the Middle East? MR. NEWT GINGRICH: Well, let me, let me offer three observations. First, this is not the fifth day of the war. This is the 58th year of the effort by those who want to destroy Israel. As Ahmadinejad, the head of Iran, says, he wants to defeat the Americans and eliminate Israel from the face of the earth. So we should not see this event in isolation. There is an Iran/Iraq/Syria—I mean, an Iran/Syria—was an Iraq before Saddam was replaced—Syria, Hezbollah and Hamas alliance trying to destroy Israel. I mean, we, we are in the early stages of what I would describe as the third world war, and frankly, our bureaucracies aren’t responding fast enough, we don’t have the right attitude about this, and this is the 58th year of the war to destroy Israel. And frankly, the Israelis have every right to insist that every single missile leave south Lebanon and that the United States ought to be helping the Lebanese government have the strength to eliminate Hezbollah as a military force, not as a political force in the parliament, but as a military force in south Lebanon. MR. RUSSERT: This is World War III? MR. GINGRICH: I, I believe if you take all the countries I just listed, that you’ve been covering, put them on a map, look at all the different connectivity, you’d have to say to yourself this is, in fact, World War III. MR. RUSSERT: Senator Biden, is it our war? SEN. JOSEPH BIDEN (D-DE): Indirectly, it’s our war. It seems to me it’s partially our responsibility. I don’t, I don’t agree with the World War III analogy, but I do believe that here we had Israel get out of southern Lebanon. I was there for that election, I was “an official observer.” All the talk from everyone in the parties in Lebanon, that they had to get rid of Hezbollah. The, the U.N. Resolution 1559 said that the—that as, as Israel got out, the, the army of the Lebanese people were going to move and take over that responsibility, they didn’t. But I might add that we didn’t do anything to help them. We didn’t do anything at the time to help train them. We didn’t do anything at the time to give any attention to it. And now we are, because of our lack of a prevention strategy, we’re left with no option here, in my view, but to support Israel in what is a totally legitimate self-defense effort. How can they, in fact, sit still when they have all these rockets that are very sophisticated sitting on their border, knowing they’re being—going to be fired at them and expect to stand there and the rest of the world sitting around? And the last point I’ll make, Tim, is I find it fascinating people talk about has Israel gone too far. No one talks about whether Israel’s justified in the first place. Let’s assume Israel’s overreacting. I want to see the world stand up and say, “By the way, this in fact, is an unprovoked effort on the part of a terrorist organization supported by two countries to undermine the democratic state.” Until they say that, I think it’s awful—I think it’s a secondary question whether Israel’s gone too far. MR. RUSSERT: Speaker Gingrich, President Bush, should he try to intervene in this latest Middle East crisis, seek a cease-fire? MR. GINGRICH: No. I mean, I think it is explicitly wrong and I think Senator Biden and I are basically in agreement on this. It is explicitly wrong to bring pressure on the victim. I mean, Israel did everything it could to withdraw from south Lebanon, and the result was terrorist missiles. Israel withdrew from Gaza, creating an opportunity for a self-governing Palestinian people to create a place of prosperity, and they’ve created a place of terror. And I think for us to now say—imagine that was Miami. Imagine Miami had missiles being fired at it every day. Remember that when Israel loses eight people because of the difference in population, it’s the equivalent of losing almost 500 Americans. Imagine we woke up this morning and 500 Americans were dead in Miami from missiles fired from Cuba. Do you think any American would say, “Now, we should have proportionate response. We shouldn’t overreact”? No. We would say, “Get rid of the missiles.” And, and John F. Kennedy, a Democrat who understood the importance of power in the world, was prepared to go to nuclear war to stop missiles from being in Cuba. MR. RUSSERT: What do you mean do something about Syria and Iran? MR. GINGRICH: I mean do whatever it takes—look, let’s say that tomorrow morning the Syrians decide to engage Israel. Let’s say the Iranians decide that they’re going to reinforce their 400 Iranian guards. MR. RUSSERT: What do you do? MR. GINGRICH: Well, the first thing you do is say they’re not going to have any over-flight privileges. MR. GINGRICH: The second thing you do is you say to the Syrians, we have great capacity to pressure the Syrians if we want to. I gave a speech at the American Enterprise Institute three years ago and said that the State Department approach of trying to deal with this dictatorship would fail. I think by any reasonable standard, trying to be nice to the Syrians, trying to understand the Syrians, is a dead loser as long as this dictatorship is there, because the planning meetings with Hamas and Hezbollah occurred in Damascus with the Iranian and Syrian ministers. MR. RUSSERT: But an attack by Syria or Iran on Israel would be considered an attack on the United States? MR. GINGRICH: I think it should be, it should be an action that we would reinforce the Israelis and others in doing what is necessary. And I think we have—clearly have the capacity to do something. I’m not describing going—widening a war. I’m saying the first step has to be to understand, this is an alliance- -Syria, Iran, Hezbollah, Hamas—and you can’t deal with it in isolation. There's more, too. Great job, Mr. Gingrich & Senator Biden. "You Must Be In Love With Occupation"
MordyS: Hear ye! Hear ME! Haveil Havalim #77 is up! Haveil Havalim #76 is up!